A visit to Auschwitz cannot be put into words. We will remember it for the rest of our lives as we return again and again to process and try to comprehend the atrocities committed and the pain of those who suffered and the million and a half Jews and other victims who were tragically killed in this place. Because of the nature of our study abroad program, our experience in Auschwitz and Birkenau on June 5, 2012, placed emphasis on the Sinti and Roma, who alongside Jews were targeted for extermination by the Nazis. Considered racially inferior, Sinti and Roma were ordered out of lands controlled by the Reich. Many were initially resettled in Jewish ghettos and camps. Many Sinti were placed in the Lodz Ghetto and were murdered at the Kulmhof extermination center. In early 1943, the remaining Sinti and Roma were transferred to Auschwitz. They were categorized as “asocials” and bore the mark of a black triangle, distinguished by the additional letter Z (for Zigeuner, the German term for “Gypsy”). Roma families at Auschwitz were not separated from each other, as was the case with Jewish families. A Zigeunerlager (Gypsy camp) existed in Birkenau for 17 months. There, Roma families lived together in a cramped barrack that no longer stands today. Out of the approximately 23,000 Sinti and Roma deported to Auschwitz, more than 20,000 died from starvation and disease or were killed in the gas chambers. A monument commemorating Sinti and Roma stands today at block 28 in Birkenau. 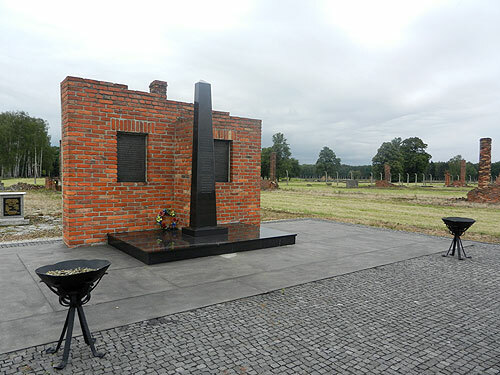 A monument commemorating Sinti and Roma stands today at block 28 in Birkenau. 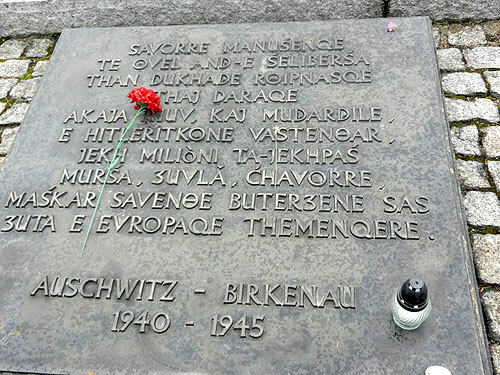 A plaque in the Sinti language is also part of the main memorial at Birkenau that reads “Forever let this place be a cry of despair and a warning to humanity, where the Nazis murdered about one and a half million men, women, and children, mainly Jews from various countries of Europe.” The inscription appears in Hebrew, English, Sinti, Polish, Slovak, Ukrainian, Greek and other languages representing the countries of Auschwitz’s victims. "Forever let this place be a cry of despair and a warning to humanity, where the Nazis murdered about one and a half million men, women, and children, mainly Jews from various countries of Europe." We spent the morning in Auschwitz I, the labor camp marked by the sign “Arbeit Macht Frei” (Work sets you free) and the afternoon in Birkenau (recognizable by the railroad tracks). Our guide took us behind the barbed wire fence to the right side of the Birkenau camp with mostly barrack remains (the barracks on the left side still remain) to block number 18, the site of the Zigeunerlager Roma barrack. Students read survivor stories out loud and spent quiet moments there. 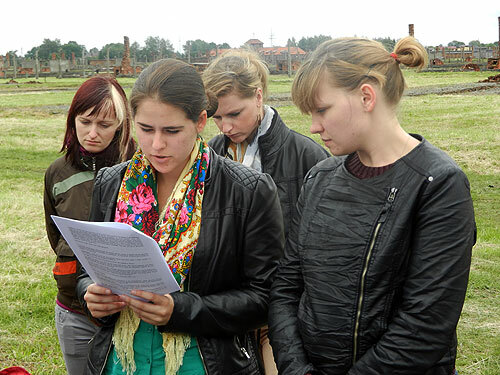 Students read excerpts from Roma survivor testimonies and memoires at Block 18, the site of the Sinti and Roma "Zigeunerlager" in Birkenau. We walked around the perimeters of the camp and noted that monuments in the Sinti language stand alongside monuments in Hebrew. These have been put up in the last 10 years, together with the Sinti monument at block 18 and the exhibition on Sinti and Roma before WWII in block 13, one of the barracks at Auschwitz 1 in the area of the camp now dedicated to the history of ethnic groups who perished in the camp. These monuments and the exhibit show steps toward the integration of Roma into Holocaust history. In Romani, the Holocaust is known as the Porajmos (“the Devouring”), in Hebrew, the Shoah (“the Catastrophe”). The details of Roma Holocaust history have not been widely known until relatively recently. There were fewer Roma academics and activists than today who could expose this history. The tragedies were passed down orally through Roma families and only began to become more public as more generations of Roma became involved in Roma rights. The construction of a “Roma” identity, based on a shared language and history of migration from India 1,000 years ago, began to take shape in the 1970s and has helped bring Roma Holocaust history into world consciousness. Roma identity has been reinforced through the acceptance of a Romani flag (blue and green with a red wagon wheel) and a shared anthem (“Djelem, Djelem” – We Travel On) in which the second verse makes reference to the Holocaust. We will rise high if we act. Films such as Tony Gatlif’s “Latcho Drom” (1995), structured to reinforce a shared history through the narrative of a musical migration from India to Europe, included the Porajmos in the narrative of Roma history as a shared tragedy for all Sinti and Roma. The film features a song about Roma experiences in Auschwitz – it can be heard in this YouTube excerpt. Many Roma deaths during WWII were undocumented because nomadic Roma were murdered by Nazis in forests. Before it was the site of a 1943 massacre of Jews, Babyn Yar (Kyiv, Ukraine), was the final resting place of the murdered residents of two Roma camps in the area. Through oral history projects and increased scholarship and awareness, atrocities committed by the Nazis against Sinti and Roma have become more well known. According to figures put forth by the U.S. Holocaust Museum, approximately half a million Sinti and Roma were killed during the Holocaust, alongside 6 million Jews and 5 million non-Jewish victims.